Perth science-teacher-turned-history-author and founder of the Light and Sound Discovery Centre, Richard Rennie, tells the early story of how Perth’s radio station 6WF became the ABC’s first broadcasting outlet in Western Australia. Richard’s talk, which has been presented at a number of venues, is now a video that can be viewed online, and embedded within this article. Much of his presentation is based on the scrapbook kept by the esteemed radio pioneer and 6WF founding engineer, Wally Coxon. These talks coincide with the 80th anniversary of the Australian Broadcasting Corporation, and the Wireless Hill Centenary Celebrations. 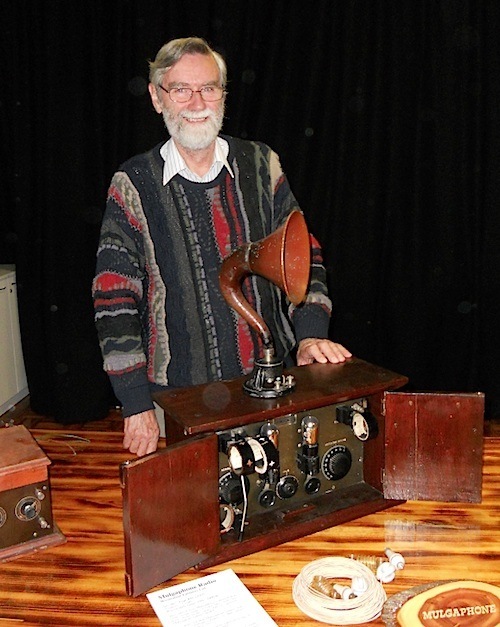 Richard’s presentation featured antique receivers from The Vintage Wireless and Gramophone Club, to illustrate the equipment available during the pioneering era of radio in WA. The talk reported on here, was given on Wednesday 18th July, 2012 at the monthly meeting of the Australian Museum of Moving Pictures and Television (AMMPT). The same presentation was made at a variety of venues, as part of Richard’s role as an educator, particularly using his skills to inspire young people and young teachers alike. Perth science-teacher-turned-history-author and founder of the Light and Sound Discovery Centre, Richard Rennie, tells the story of how Perth’s radio station 6WF became the ABC’s first broadcasting outlet in Western Australia. Much of this is based on the scrapbook kept by the esteemed radio pioneer and 6WF founding engineer, Wally Coxon. This article expands on the subject, placing events in historical perspective with other happenings of the time, and extends the story to the present. In 1924, Westralian Farmers Co-operative Limited (Wesfarmers) began operating radio station 6WF from the top floor of the company’s Wellington Street building. The floor was divided into two studios, the smaller used for news broadcasting, the larger for music and entertainment. The studios were fitted with the latest equipment for the era, with the wall cavities filled with sawdust for soundproofing. The transmitter mast had two massive radio towers, each weighing 3.5 tons located on top of the building. 6WF was initially a long-wave station with 5 kilowatts of power on 1250 metres, 240 kHz, until the Australian Broadcasting Company took over five years later and it left long-wave and moved to 690 kHz on the medium-wave band on September 2, 1929. The first manager and chief engineer of 6WF was Wally Coxon, where the station facilities were manufactured and erected by Amalgamated Wireless (Australasia) Limited. It was installed at a cost of approximately £12,000 and had a broadcasting capacity of 600 miles. The long-wave band was selected as it covered a larger area than a transmitter on the medium-wave band. This is because ground-wave propagation suffers less attenuation due to limited ground conductivity at lower frequencies. To gain extra coverage for 6WF programs, Wally Coxon also broadcast on the short-wave band, as these radio frequencies can reach vast distances by being refracted back to the earth by the ionosphere (a phenomenon known as “skywave propagation”). Important factors when 6WF was targeting the widely dispersed farming community. The station was officially opened on June 4, 1924, by the Labor Premier of WA, Mr. Philip Collier. “To celebrate the occasion, the company invited a large number of guests to the ceremony. Prior to the actual opening ceremony, the guests, who numbered several hundred, inspected the plant…” The Premier declared the station open from the studio on an upper floor, where the speech and subsequent concert was transmitted. Vladimir Lenin died and Joseph Stalin began his bid for leadership of the USSR, whilst Lenin’s body was placed in the Mausoleum in Moscow’s Red Square. Silent movies still prevailed, though the 1920’s (Roaring Twenties), Jazz and Ragtime music gramophone recordings and Broadway musicals were a feature. The 1920s was regarded as an exuberant, freewheeling and boisterous era of prosperity, fast cars, jazz and speakeasies in the US (where the flapper redefined modern womanhood). The Art Deco design style began in Paris and then flourished internationally. Finally the Wall Street Crash of 1929 ended the era, as the Great Depression set in worldwide, bringing years of gloom and hardship. 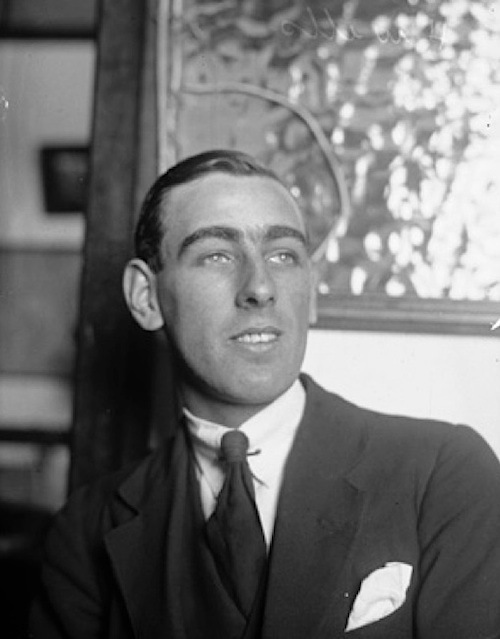 Wally Coxon was described as “The Father of Radio in Western Australia”, acquiring the first Experimental Broadcast License in Western Australia (XYK, later known as 6AG), after becoming interested in wireless experiments as far back as 1907. He gained his Proficiency in Radio with the UK based North Eastern School of Wireless and continued there for some time as an instructor. The school was founded in 1911 to train Radio Officers for the Merchant Marine, then affectionally known as ‘Sparks’. Radio Officers on ships not only operated the radio equipment, but also repaired and maintained it, so this was an excellent grounding for a pioneer in the new industry. It was in mid-1910 that the PMG Department issued the experimental stations with 2 letter call signs prefixed by “X” for experimental. Wally Coxon was allocated the call sign XYK. Two years later, the government’s morse code Applecross Wireless Station, POP (later VIP), commenced operations in 1912. In mid 1914 the experimental station call-signs were altered with a number to identify the State. Wally Coxon’s call sign then became 6AG. The experimental licence later became the Amateur Station Licence, with the licence holders now referred to as HAM operators. By 1927, the prefixes VH to VK were being used by the HAM operators, so Wally Coxon’s call sign then became VK6AG. Wally Coxon used his amateur transmitter to conduct experiments on shortwave. At the 1918 Perth Royal Show, he staged a public demonstration of radio broadcasting with a transmitter in one pavilion and a receiver in another. His amateur wireless station also broadcast regular musical transmissions. 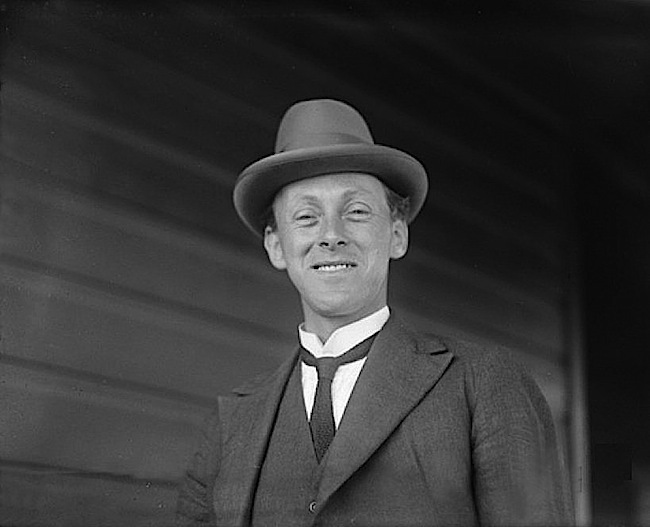 Prior to 1923, the radio manufacturing industry in Australia, led by (Sir) Earnest Fisk of AWA, lobbied the Commonwealth government for the introduction of radio broadcasting for the public consumption. The first concept involved sealed sets where stations were licensed to broadcast and the receivers were set to receive only one station. In 1923, a small group of likeminded people formed the Subiaco Radio Society, which grew in influence until World War II (1939-1945) intervened, to then resume activities once peace was restored. Members included Wally Coxon (VK6AG), Bill Phipps (VK6WP) and Harry Simmons (VK6KX), who all became chief engineers of radio stations in WA. Before the establishment of Radio station 6WF in 1924, the amateur community was permitted to broadcast news and music using their call sign 6BN, registered to A.E. Stevens, for the Subiaco Radio Society. Once regular broadcasting commenced, amateurs were no longer permitted to continue this practice, although some did so for several years. When Wally Coxon lived in Bulwer Street, Highgate, he would broadcast live concerts from the living room in his home. 6WF started as an offshoot of an agricultural firm as the farmers needed to be kept aware of the markets, especially the wheat trading prices. 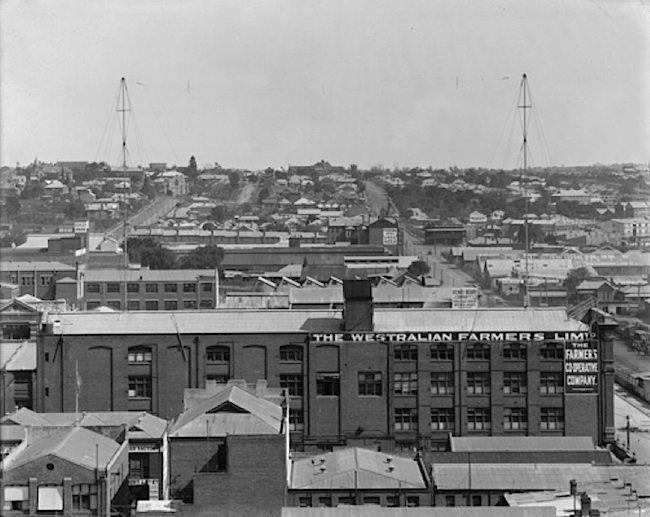 Westralian Farmers Co-operative Limited (Wesfarmers) began operating radio station 6WF on 1,250 metres in the long-wave band from the top floor of the company’s 569 Wellington Street building, on Wednesday 4 June 1924. The transmitter mast on the roof had two massive radio towers, each weighing 3.5 tons. 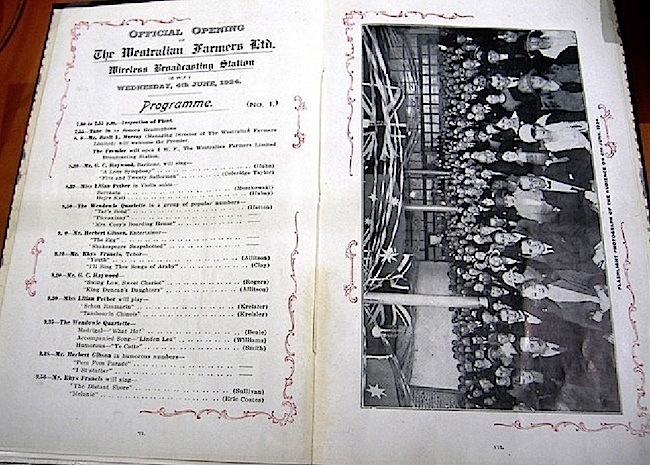 To celebrate the opening, there were more people attending the ceremonies at the Westralian Farmers site than there were receivers in the hands of listeners, which numbered 200 of the company’s Mulgaphones. In fact there were so many guests in attendance that the opening was conducted over two nights. The Wesfarmers building had four floors, with the broadcasting studios on the top floor and transmitting mast on the roof. 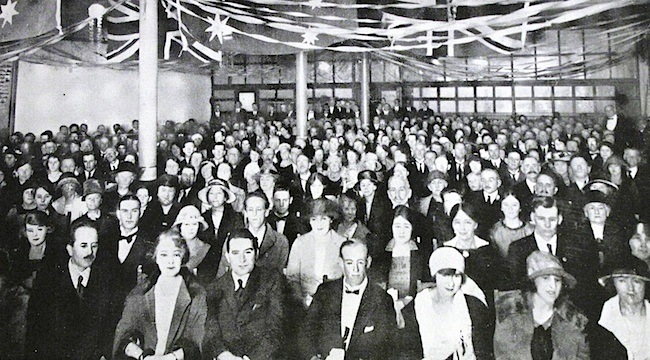 The third floor was the company’s social hall, where the guests assembled to hear the broadcast through loudspeakers, which conveyed the events taking place on the floor above. The activities were spread over three levels, from audience, performers and transmitting mast. Wesfarmer’s aim was not so much to entertain, as disseminate timely farming information as far across the state as the signal could reach. The tyranny of distance, poor roads and infrequent news and mail put many of our primary producers at a disadvantage, and sometimes at the prey of unscrupulous buyers who aimed to acquire their produce at a lower than market value. Those who were interested in becoming listeners of 6WF gained access by paying a subscriber fee of four guineas under the sealed set system. This was an annual fee of £4/4/- plus 10/- to the Postmaster-General’s Department, which was the supervising authority. Each receiver that was sold was set to receive only one station, not that there were anymore locally, though on good nights the Sydney and Melbourne stations did reach over here. For the first three months of 6WF’s operations only 300 licences were taken out, but after the Royal Show of 1924, there was an increase. 871 licences had been issued by 6 months, and after 10 months and many complaints, the sealed set system was abandoned with a considerable increase in licences resulting with open sets now into use. Early 6WF programming was left to the discretion of Wally Coxon, who used a criteria based on what he perceived as quality, with better concerts, more interesting programs and service all the time. Outside broadcasts were a feature of 6WF with the first political speech broadcast from the Queen’s Hall, in William Street, Perth, on Friday, March 13, 1925, the first theatre broadcast was a vaudeville programme from the Luxor Theatre in Beaufort Street, Perth, on Wednesday, March 18 1925, and a harness racing event from the W.A. Trotting Association track on the perimeter of the Western Australian Cricket Association Ground on Saturday. April 11, 1925, followed by the play “Peg of My Heart” from His Majesty’s Theatre, Perth, on Wednesday, May 27, 1925. Other such broadcasts came from the government gardens and Boans department store. 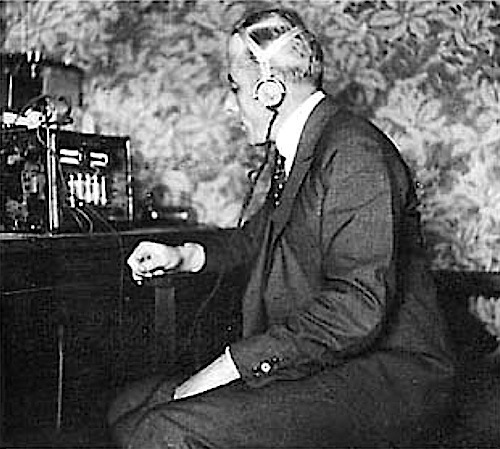 In July 1925, Wally Coxon re-broadcast the programs from 6WF’s long-wave transmission over his own amateur station 6AG, simulcasting from his suburban home. The purpose of the short-wave relay was to increase the coverage to the more distant areas of Australia’s largest state. Even with all this effort, it took a while before radio gained great popularity in Western Australia. There was the high cost of receivers and license fees to contend with, and a form of amusement that people were not familiar with at first. It was a learning exercise for both the station and the audience. It took longer for radio to be habit forming in WA, than it took television 35 years later to become addictive. By then people were used to the intrusion in the home, and in fact welcomed it. Back in 1924, WA did not have the scope of talent that existed in Sydney and Melbourne. The technology was still primitive, with performers working to one microphone in the studio. Then there was no air-conditioning in the studio. When live artists were not available, music was provided by a self-playing piano (known as a pianola) which was programmed by a roll of paper perforated with holes that represented the notes. This instrument was at the peak of its popularity in 1924, when 6WF opened. There was also a windup gramophone in the studio, with no electric pickup, so a microphone had to be placed next to its horn. The equipment that generated the original Time Signal was located in the apparatus room. This was operated direct from the Perth Observatory. 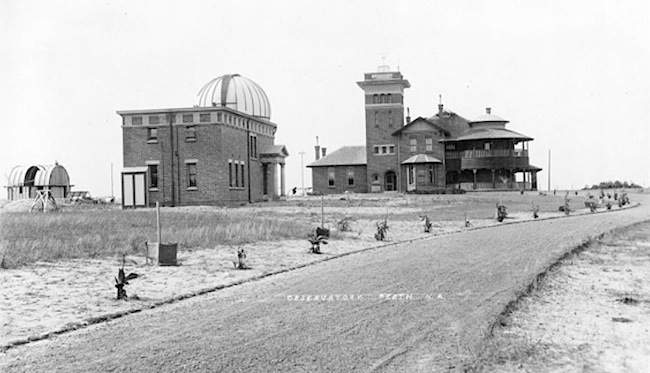 To provide accurate time, a Transit telescope was set up at the observatory in 1898. 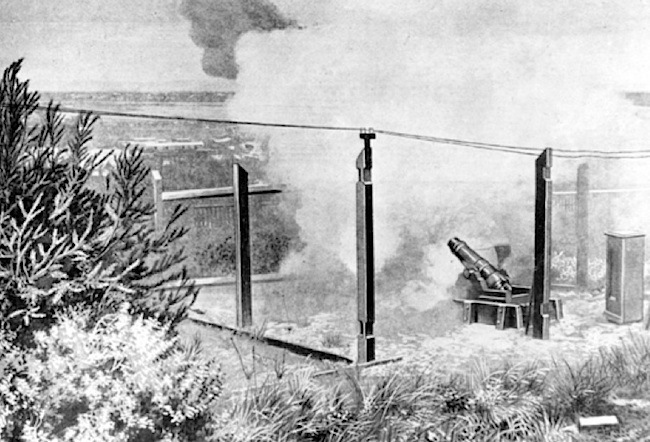 In 1902, an ingenious contraption was assembled to fire a small six-pound cannon to signal one o’clock to the city. From 1924, the same contacts that operated the time gun at the observatory also operated a relay in the 6WF apparatus room, which sounded a gong. The Time Signal was at first broadcast each day at 1pm and 8pm Western Standard Time. The Town Hall chimes were also broadcast at various times during the day. Following the Observatory time signal, meteorological information and the weather report was given. This procedure was repeated during the evening. In September 1926, Wally Coxon relayed the British Broadcasting Company’s 2LO London, via Philips Laboratories in Holland, on short-wave for retransmission on 6WF for local listeners (the British Broadcasting Company was replaced by the British Broadcasting Corporation in 1927). 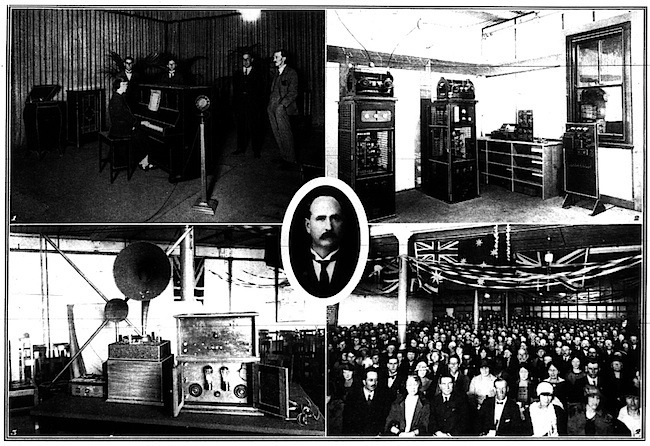 2LO originally started on 11 May 1922 as Marconi’s second British radio station. 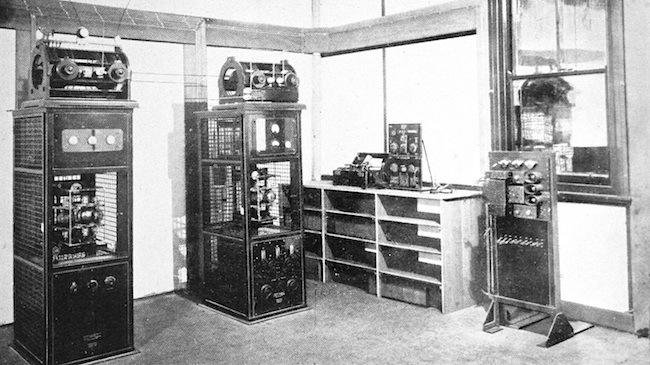 Philips transmitted experimental shortwave broadcasts to the Dutch East Indies, which became regular from May 30, 1927. Expectations at first varied so much that it was impossible to please everyone, particularly the newspaper critics who found fault in almost everything. Tastes also varied along highbrow and lowbrow lines. There evolved a notion that radio should set a precedent for the community and educate rather than provide what people may prefer. Cultured British english was determined to be how we all should speak, and in particular radio announcers, who were to set the example. It was a time when a significant number of the public were of English origins, or next generation, with Britain still considered the mother country. By 1927, there were eight A-class radio stations and twelve B-class stations in Australia, but only one station in WA, being 6WF. They were located in the heavily populated areas which had the most listeners and revenue from licence fees, in the case of the A-class stations -and- maximum advertising revenue for the B-class stations. Also in 1927, Amalgamated Wireless (Australasia) Ltd (later AWA Ltd) conducted a series of shortwave transmissions to Britain. These regular broadcasts were heralded by a kookaburra’s laugh – a practice that’s still used by Radio Australia today. Radio Australia was formally incorporated as part of the ABC in 1939. Meanwhile, there was listener dissatisfaction with the local radio programs and coverage. Whilst seeking a solution, the Commonwealth government considered that the Australian rural population was too scattered for the American free enterprise system to be viable here, with their programming based on popularity and a business model based on advertising. The more ears listening, the more attractive it was to clients and resulting revenue flow. This was in contrast to the British notion of the BBC as a cultural institution that informed, educated and entertained, in the service of the public. Though the logistics were different here, as Britain had a large population in a small country, whereas Australia was the opposite. Meanwhile, the American system and management was more diversified in the US, than the monopoly BBC was in the UK. b - The development and utilisation of wireless services for public requirements within the Commonwealth. The government was committed to establishing broadcasting services that would be available to the whole population and hoped that the larger capital-city (Class A stations) would subsidise the smaller country-town stations. Unfortunately, the larger stations refused to agree to this Government scheme. A compromise solution was then implemented by the government, which nationalised the Class A stations as their licences expired, with the facilities purchased by the government and the technical services handled by the Post Office. 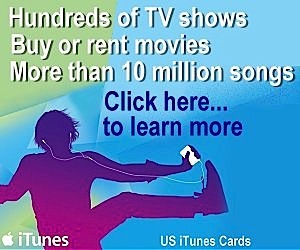 The programming was then contracted out to private enterprise, and funded by a compulsory license fee. In mid-1928, the Commonwealth government established the National Broadcasting Service. As licenses for the Class A stations came up for renewal they were cancelled and reissued to the National Broadcasting Service – with their transmitters and studio equipment being purchased by the Government. Following the demise of silent movies from 1928, for which professional musicians had provided a musical accompaniment, they found work by forming The Perth Symphony Orchestra, under the direction of Harold Newton, which then performed in Queens Hall and in the Town Hall. Many of these concerts were broadcast by 6WF. 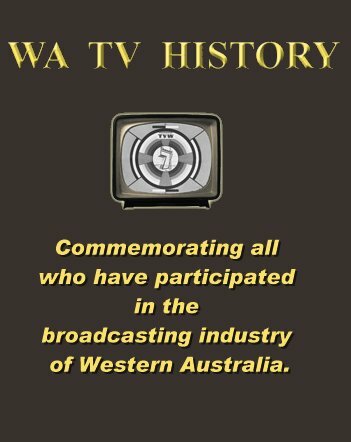 The Commonwealth government bought 6WF for £7,000 on 6th December, 1928, with the successful program tender going to an entertainment consortium that called itself the Australian Broadcasting Company. The company won a three year programming contract till 30 June 1932. Union Theatres, Fullers’ Theatres and Alberts Music Publishers were the partners in this new company. In WA, Union Theatres operating the Grand Theatre and the Prince of Wales in Murray Street, and the Ambassadors and the Pavilion in Hay Street, until the company was liquidated during the Great Depression, and its main assets purchased by Greater Union Theatres. Fullers’ Theatres had established a vaudeville empire on both sides of the Tasman, and also moved into musical comedy. But with the advent of sound movies, vaudeville took a hit and cinema equipment was installed in most Fullers’ theatres. J. Albert & Son was involved in music retail and struck deals with American and British music publishers, purchasing the copyright for songwriters such as Irving Berlin and George Gershwin. 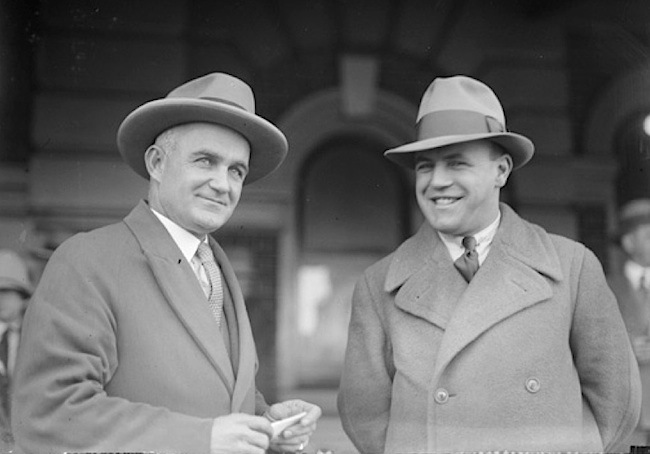 In 1926, J. Albert & Son co-founded the Australasian Performing Right Association (APRA). Over the next 50 years the J. Albert & Son empire gradually acquired interests in commercial radio stations, in what later became the Macquarie Radio Network. Later still the company became a shareholder in ATN Channel Seven in Sydney. 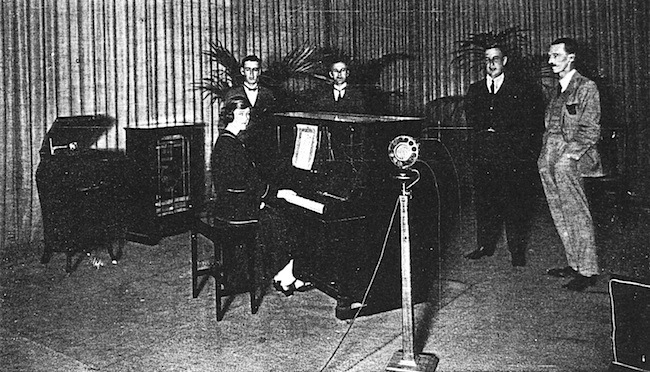 The Union Theatres connection proved useful as 6WF broadcast recitals from the Ambassadors Theatre with Les Waldron at the Wurlitzer organ, and Bert Howell’s Ambassadors orchestra accompanying tenor Harry Rose and soprano Lulu Potter, and many other artists, including Paul Day and Nellie Seastream. This was during the period that the Ambassadors was owned by Union Theatres, until the company experienced liquidity problems and the cinema joined the General Theatres Group in 1932. The theatre was then taken over by Hoyts, later in the decade. The method of paying the Australian Broadcasting Company for its service consisted of giving them 12/- of the metropolitan zone licence fee, which had been reduced to 24/- in 1928. The government kept 9/- for technical services and administration, with the remaining 3/- forming a patent royalty fee for Amalgamated Wireless (Australasia) Ltd. Though WA had only one station, the government had set up a two-tiered licensing system for broadcasting stations. Class A radio stations were funded by listeners’ licence fees collected by the Government, and were allowed minimal program sponsorship. Class B licence holders were the original commercial stations, which received no revenue from government, but could sell airtime to advertisers. Licences were granted for five year periods. The first Class B (commercial) station on air in Australia was 2BE in Sydney on November 1924, but closed in 1929 due to financial problems. 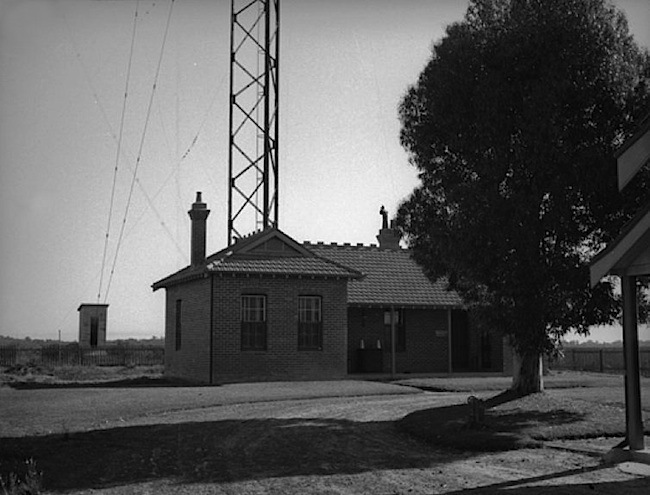 The oldest surviving Class B station is 2UE, which went on air on Australia Day 1925. The Australian Broadcasting Company (1929-1932) period coincided with The Great Depression, a severe worldwide economic downturn, which started in 1930 and continued until the industrial effort for World War II lifted the economy out of the doldrums. This was a big factor in making the government’s concept seem like a failure in the short term. It was also hard to please all the people all the time, as witnessed by continuing criticism in the newspapers. The public wanted cheaper sets, which meant moving 6WF onto the medium-wave band so that listeners could purchase more affordable sets from the eastern states. This happened on September 1st, 1929, when 6WF moved to 435 metres (690 kHz) on the same broadcast band used by stations on the east coast, though this caused difficulties for listeners who wished to tune into alternate programs from Sydney and Melbourne, as 6WF tended to drown them out. Added to this there was interference from the powerful Applecross morse telegraphy radio station VIP on 500khz, the maritime distress and emergency frequency. The AM broadcasting band at that time was 300 metres (1000 kHz) to 500 metres (599 kHz), but station tuning posed a problem with the early receivers, for the Tuned Radio Frequency (TRF) receivers of the 1920s suffered from poor selectivity, low sensitivity, with a tendency towards instability and oscillation. Due to the limited number of available channels in Australia on the medium-wave band, the same frequencies were re-allocated to different broadcasters, provided they transmitted several hundred miles apart. But on nights of good propagation, distant stations appeared superimposed onto local ones. This was even more a problem for crystal set owners where the station selectivity was even worse. As a consequence, the coverage for WA listeners suffered until all could afford the more superior Superheterodyne receivers, that came in during the 1930s. 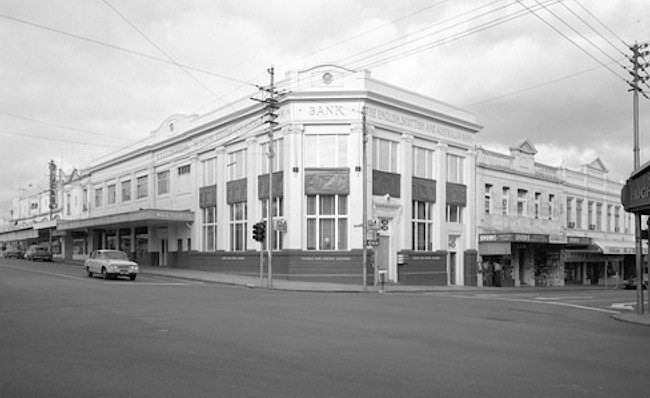 In 1930, the 6WF operation moved from the Wesfarmers building to the first floor of the English, Scottish and Australian Bank (E.S. & A.) building at the corner of Hay and Milligan Street, Perth. Under WA manager Basil Kirke’s direction, 6WF extended its programs and introduce new features. The value of this was shown by the rapid increase in licences, so that after three years, the company had increased the licences from 3,900 to 12,500. Yet criticism still appeared in the newspapers, with much of it directed at 6WF’s move to the medium-wave band in 1929. Even though Basil Kirke was a great innovator, the public still complained about the programs, whilst the Australian Broadcasting Company was running at a loss. At this time there were only twelve Class B commercial radio broadcasting licences issued, with none yet operating in WA. The 1930s saw the beginning of radio drama with stage plays and books adapted into radio plays. Also original plays and serials were written for the medium, with the strength of this activity taking place in Sydney and Melbourne. All programs went to air live in the early days. It was not until 1935 that disc recorders started being installed in ABC studios. It was the only means for recording program material until the arrival of tape in the 1950s. Drama was one of the most demanding forms of live performance with complex sound effects and mood music added. Many plays were specially adapted for radio, including the classics, for all 36 of Shakespeare’s plays were produced and broadcast from 1936 to 1938. Perth was connected by a telephone line to Adelaide in 1930 (and subsequently the rest of the eastern states) and the first overseas calls from Australia became possible with the introduction of a radio telephone service to England, also in 1930, and through there to Europe and America. A similar service opened to New Zealand in the same year. The landline quality to Sydney was poor, as the program was carried long distances over the Nullarbor and beyond. Only speech could be sent, as the line quality was not suitable for carrying music. Also in 1930, Perth’s second radio station was launched on 19th March when Musgrove’s Limited opened their commercial station 6ML. Then the flowing year, 6PR began broadcasting from the Applecross Wireless Station site. 6PR was then owned by Nicholson’s Limited, with studios located on the second floor of their music shop at 86 Barrack Street, Perth. 6KG Kalgoorlie also commenced broadcasting in 1931. The retail traders had been highly critical of 6WF for how they perceived the poor signal reception impacted adversely on the sale of receivers. Now two key music and radio appliance stores were in the broadcasting business too, as Class B commercial stations. Some interesting dynamics existed at this time as the Class B stations were privately owned commercial broadcasters, which derived their revenue from advertising, and thus made them a direct competitor with newspapers. There was also concern over the radio stations reading the news direct from the newspapers. A gentleman’s agreement was reached which enabled news to be read from the papers, but with some restrictions. West Australian Newspapers first entered into the broadcasting business with radio station 6IX, which it half owned with the Perth music store Musgroves, trading as W.A. Broadcasters Limited. The station opened on 27th November 1933. As an alternate source of radio programs, the British expatriates could tune in to the BBC Empire Service from 1932, which was broadcast from the English town of Daventry, located 77 miles (124 km) north-northwest of London. The radio announcement of “Daventry calling” made the town well-known across the world. The discovery and development of shortwave technology during the 1920s and 1930s permitted radio stations throughout the world to transmit their programs over long distances, even worldwide, for the first time. Once audiences discovered this international source of content on the shortwave bands of many consumer radio receivers, a number of magazines and listener clubs arose as a result. Just wondering if there were any recordings kept from 6WF. I have a relative who owned an opera company . Great website, thank you so much. One minor point, my understanding is that the A class licences were not cancelled, they simply expired and were not renewed. Further new licences were not issued to the NBS, at that time licences were not required of Commonwealth entities. Without having researched 6WF specifics, it would also be reasonable to say that the studio building and transmitter building would have been leased for a period by the Commonwealth from the owner (Wesfarmers), certainly that was the case for 4QG.